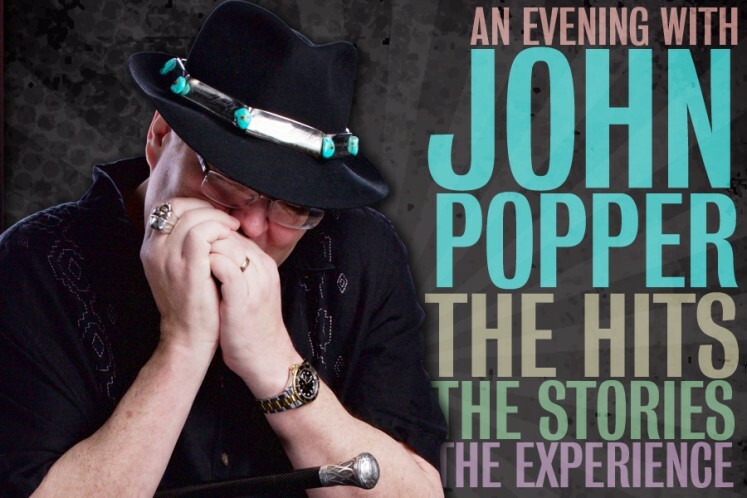 Home > EVENTS > An Evening with John Popper: The Hits. The Stories. The Experience. An Evening with John Popper: The Hits. The Stories. The Experience. Harmonica wielding frontman of Blues Traveler, John Popper, in “The Hits. The Stories. The Experience.” No topic is off limits when one of the greatest voices of a generation shares his behind the music stories, band exploits, hit songs and favorite covers. Imagine VH1 Storytellers meets MTV Unplugged! John Popper was born in Ohio in 1967 the son of a Hungarian immigrant, and raised in Connecticut. Music runs in his family, as Popper is related to the 19th century European cellist David Popper, whose work remains some of the most popular pieces of music written for the cello. Along with his high school friends Brendan Hill, Chan Kinchla, and Bobby Sheehan, John Popper formed the group Blues Traveler in the late 1980s in New York City. With their improvisational style and unquestionable talent, Blues Traveler was known throughout the country as an exceptional jam band. It wasn’t until 1994, with the release of the album Four that Blues Traveler reached mainstream success. The group won the Grammy Award for Best Rock Performance by a Duo or Group with Vocal in 1996 for their song “Run-Around,” which Popper himself composed. As well, their song “But Anyway” was featured in the cult classic comedy film Kingpin, starring Woody Harrelson and Randy Quaid. With the success of Blues Traveler, John Popper explored a solo career, releasing the album Zygote in 1999. The debut album was produced by Terry Manning and featured a variety of special guests including the Dave Matthews Band drummer Carter Beauford. Released days after the death of Poppers’ former bandmate and friend Bobby Sheehan, Zygote was a critical point in the talented musician’s career. Shortly after, John Popper would form the John Popper Band and land his first role in a movie with Just for the Time Being with supermodel Eva Herzigova. Popper rejoined Blues Traveler in the turn of the century with the addition of two new members, and the genre-bending group of musicians have been touring and recording ever since. 2017 marks the 30th anniversary of Blues Traveler as a band and the group continues to amass fans around the world. In their latest album Blow Up the Moon released in 2015, every track on the recording is a collaboration with another artist, with guests such as Hanson, Plain White T’s, and Jewel. For his performance at The Lyric, John Popper will explore his long and successful career, from the formation of Blues Travelers to his solo career and beyond. As Popper said in an interview with Rolling Stone magazine, “I’m just trying to count the steps behind me, and there are so many steps.” Count the steps with him as he takes you through his incredible career.